PORTLAND, Ore. — At the Hawthorne Fred Meyer store in Southeast Portland, a well-dressed man greets every shopper who walks through the door. “Hi! How are you doing today? Good. Very, very good,” he said. His name is Sam Scherer. He’s 30 years old and single. And for the last 9 years he’s served the community of shoppers here with his smile and warmth. “Hey, how you doing, sir?” Sam asks with a wave of his left hand. Sam loves clothes. This day he’s dressed in a black suit with a crisp white shirt, and a purple bow tie. His black hair is slicked back, and his long sideburns are perfectly trimmed. He makes a big impression on shoppers like Yomaira Lampi. “He's friendly. He's always saying hello to you I mean like to everyone who comes in here. He just like perks up your day!" she said. Turning to Sam she added, “Thank you so much. He's great! I love him!" He greets customers 5 hours a day, Wednesday through Sunday, from 11 a.m. until 4 p.m.
“I don't know of any greeters that have the style and personality that Sam does,” said Assistant Store Manager Tami Griffin. He also loves clothes. He complements his look with fur coats, hats and colorful shoes. He likes making bold statements with his outfits. “I just had passions for fashion and all sorts of stuff. I used to draw and things to keep my mind focused on other things. Because I knew there was something really special for me in the future,” he said. 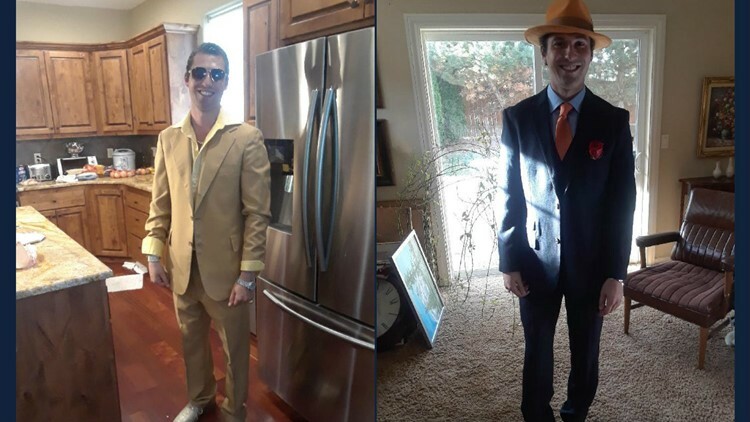 Sam Scherer in two of his stylish outfits. But first he had to deal with the present. You cannot tell when he’s standing still but you’ll notice it when Sam walks. Like more than 700,000 people in America, Sam lives with cerebral palsy. “So I was born with cerebral palsy. It’s a neuromuscular -- from birth-- it’s a disability,” said Sam. It hampers his muscles and it’s the reason he always greets with his left arm, it's stronger than the right, which is weakened by the CP. The condition also makes walking difficult, but Sam said it does not affect his mind. “Are there times when you were growing up when you're like, 'why did this happen to me? '” I asked Sam. “Yeah. It was. Yeah. It always was a challenge for me because I was in private school and stuff,” said Sam. But he overcame, finished high school and two years of arts studies at community college. And for the last 9 years, he’s stood and greeted customers at the Fred Meyer store, dressed to the nines. “I just love being formal and being well dressed 'cause I just want people to feel like kings and queens when they walk in,” he said. Sam always makes an impression—just ask the firefighters who are there almost daily. “Usually give him a fist bump on the way in at the door and he's usually in some beautiful, elaborate and I’m like jealous that I couldn't get away with wearing something like that - you know?" said firefighter Terra Vandwiele. Sam is a greeter now, but dreams of working as a fashion designer. “Yes! I would love to be one. And a model too. In TV and stuff in magazines and TV," said Sam. He said he has fashion sketches and is always online watching for the latest trends. He’s thought about design school but said he can’t afford it. (Update) Inspired by this KGW story, a GoFundMe account has been established to get Sam the money for school. Not every Fred Meyer has greeters, so Sam rides a bus to get there from Gresham. Most days it’s an hour each way, sometimes it takes two hours. And you’d never know it from his smile, but Sam often greets the community through a burning and stinging pain. “Oh well it’s all throughout my body. Its daily, it actually just stays there. It’s when I get really in pain I have to sit down. And so, I’m used to that type of pain in my body. It’s sad that I have to live with it, but I just do it,” he said. “So, you're in pain right now?” I asked during our interview at the store. “Yeah. Yeah,” he said with a nod and a smile. “And you're smiling through it,” I said. “And talking like it’s no big deal,” I said. “You are tough!” I tell him. “Yeah thank you so much, thank you,” said Sam. He is not sure what the future holds. It seems certain it will be something involving fashion. He literally wears his passion for it on his sleeve. But for the moment, he’s happy to smile at the world, to serve the community with a simple greeting. “How’s it going? Hi!” he said. “I just like representing Freddy's! it’s one of my favorite Freddy's in the world,” said Sam.